Britain’s got talent but also has something very special for the bingo admirers. Britain’s Got Bingo has everything to suit a Brit’s fancy. They have put their best talent forward in an online bingo extraordinary site. The homepage is splashed in all of Britain’s glory and wears the flag with pride. One look at Britain’s Got Bingo and you’ll fast become so hooked on its charm that even Simon Cowell would approve. Whether you are British or not you soon take a fancy to this bingo community. The website is not overstated with elaborate design with a soft pallet of blues and reds. The sliding banner of promotions is alluring enough to sign up. Their Facebook has over 500 players giving thumbs up for a site that is hard to resist. Britain’s Got Bingo is under the umbrella of Bingo Entertainment, a legendary network that has been in the online bingo industry since 1999. The site is fully licensed by the Lotteries and Gaming Authority of Malta and is operated by Plex Gaming Ltd.
Jackpots are everywhere and you will find them lurking under Super Bucks, Bingo Bounty, Money Pit and Party 90. Bingo is everywhere too with four variations including 90 ball, 75 ball, 80 ball and 30 ball bingo making it a bingo playground of full entertainment. There are 2 Free4Cash bingo rooms that are open 24 hours a day with cash prizes given away. Two Free4Points rooms are offered with bingo buck rewards. 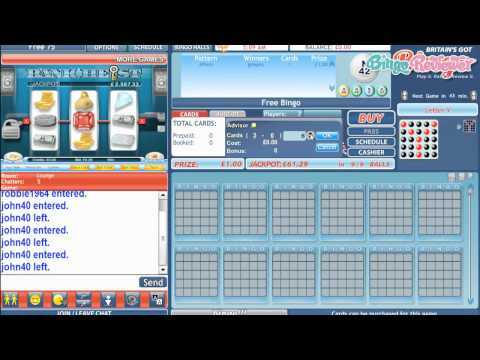 Chat Games are a fun way to win bingo bucks by interacting with your bingo roomies while playing bingo. Some chat games require players to pick and submit their favorite number before the start of the game. When you’re ready to take a break from the bingo room slots are waiting to be spun featuring Progressive Jackpots while playing Buried Treasure, Wild West and Coins of Rome. Casino games are always a favorite for players with Poker variations and Blackjack. Instant games are quick and easy to play and offer some nice winning prizes. Cheers to Britain’s Got Bingo for an attractive welcome to new players. Try out the site with free cash generously offered compliments of the bingo house. That is not all; the welcome committee is not about to stop there because when you make your first deposit a juicy bonus will be added to your account. Worry not that its over because future deposits with have a Reload Bonus. Like Britain’s Got Talent’s Facebook and post your user name and 5 free will be credited to your account. A Referral Bingo Bonus is available when you invite your friends to join and will instantly be placed in your account when the make their first deposit. Offering all four variations of bingo give this site a winning edge above the competition. We rate this Britain’s Got Bingo with 4.75 Pink Hearts.